G2 2016-10-14 It’s Clobberin’ Time! Q: What’s better than an Oilers win? A: An Oilers win over the Calgary Flames! OK, first, let’s be honest – that first period was a tire fire reminiscent of the tire fires of the past few years. Ugly. Talbot was shaky and that didn’t help either. Thank Gord for that McDavid kid though. We’re going to be saying this A LOT over the next many years. 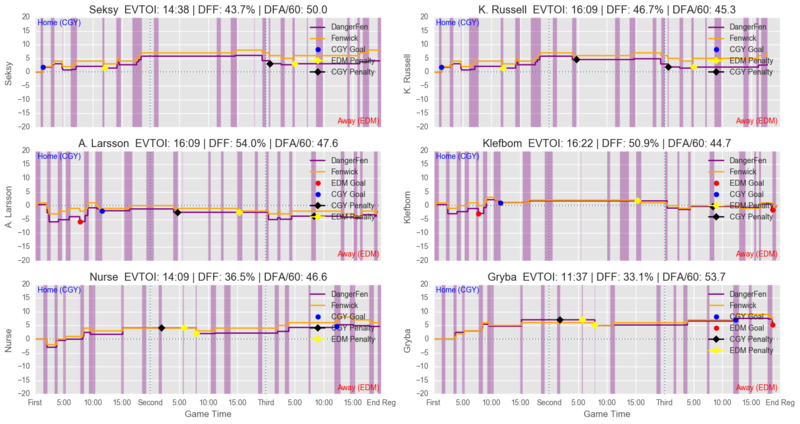 Looking once again at the invaluable gameflow diagram, the fancies were heavily in the Flames favour, but just like the first game, it was all one period … the first (duh). 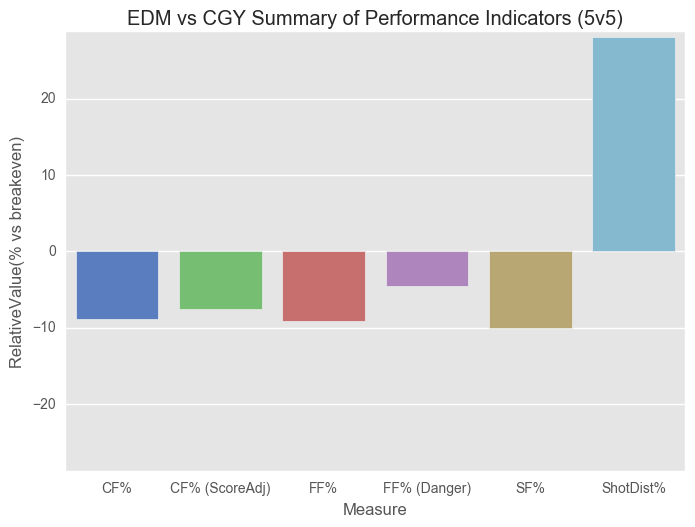 After that, not only was the game relatively even shots-wise, but you can see that the Oilers were considerably more dangerous, and the score reflected that I’d say. Like last game, you can really see a clear edge in the shot distances for the Oilers. 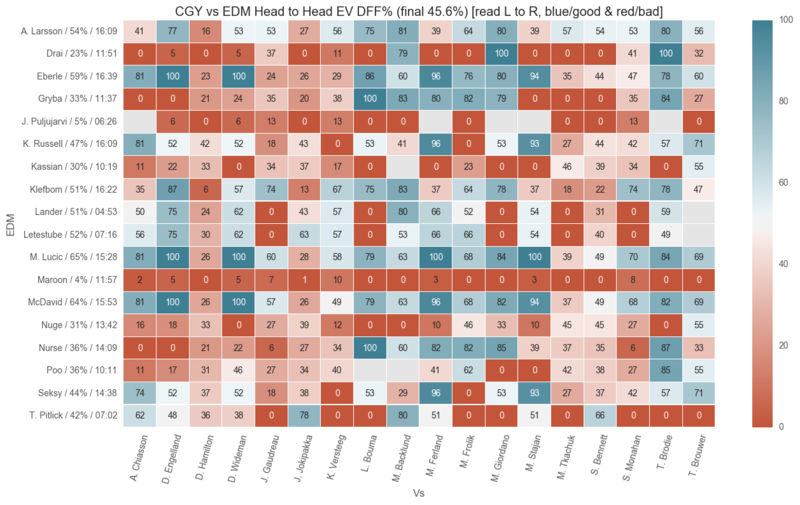 From a fancystats perspective, it was the McDavid line, and it was everyone else. 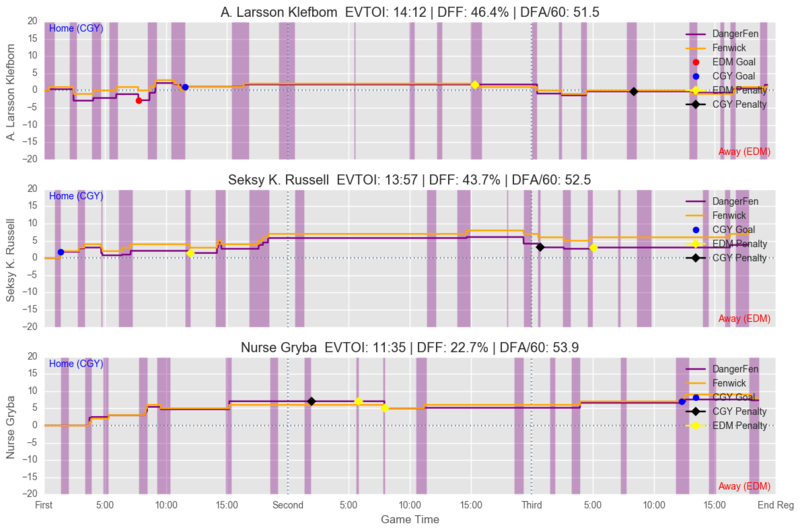 Interestingly solid game from Nurse and Gryba though, but the danger metrics suggest that is perhaps something of a mirage. The special teams were a whole lot better (two PPG, and so much better to get a SHG than give one up) … but the funny thing is they still didn’t look that good by eye. Thoughts? Puljujarvi. Not that I don’t think he’s going to be an excellent player, but other than that wicked shot, he’s not ready to play at the NHL level. 5% DFF on the night, those are Korpikoski numbers. Oilers: you traded Taylor Hall. You *need* JP to reach his potential. Please don’t f*** this up. Nuge. Keep waiting for him to break out, but that’s two so-so games in a row (against a not very good team) – and he should be in World Cup form. 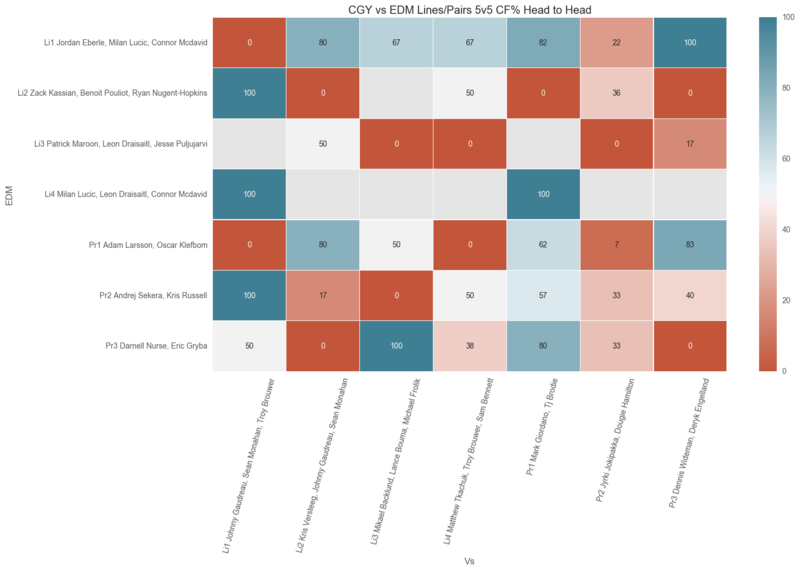 Kris Russell remains an interesting piece of work. I’m liking his game with McDavid – he seems to recognize he just needs to make the simple play, get the puck to Sekera or McDavid, and boom! it’s going the other way. But when he’s away from those guys, he’s a tire fire. That really showed in the numbers in the first game, I don’t have those numbers for this game yet but I’d bet they’ll show something similar. 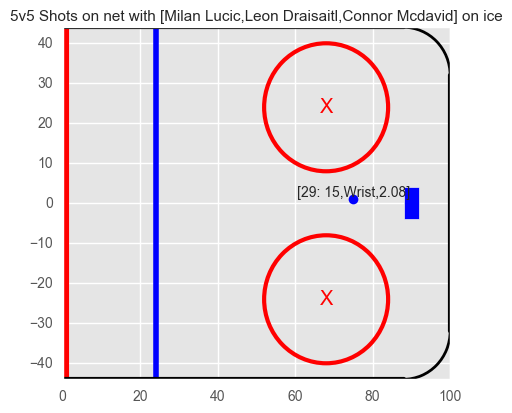 Drai had really quite a decent game in some ways, despite the rough even strength shot results. New chart! 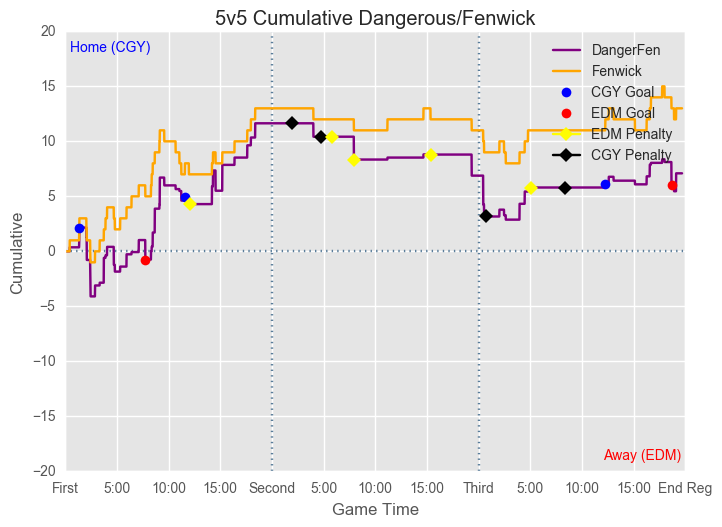 Shows how the players did directly comparing raw Corsi with DangerousFenwick. Look for big discrepenacies one way or the other. Fantastic work. The sheer volume of data is intimidating. Would love a bit more translation in what the numbers actually mean (ie. Negative Corsi bu Positive DF). Is this a fault of Corsi? Thanks man! Do you think a video walkthrough of the page would be helpful? I’m thinking of putting that together, because it is a lot of data for sure. 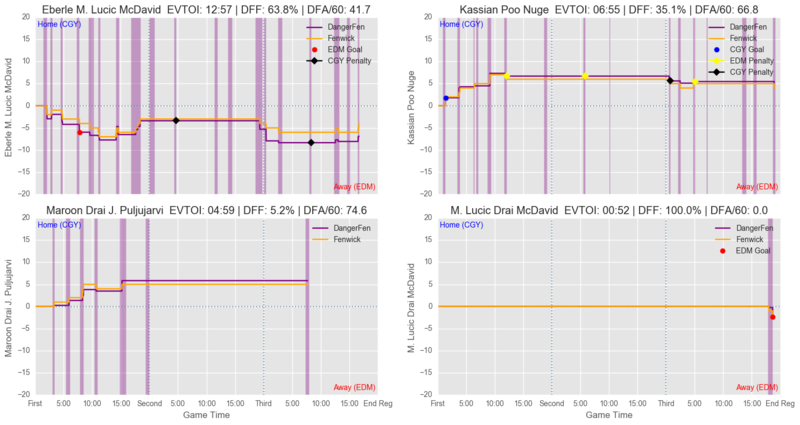 As for Corsi vs DFF (and other danger metrics like xGF), not sure ‘fault’ is quite the right word. Corsi has always been a raw count, which has advantages and disadvantages. It’s still the goto stat for most people because of its demonstrated high reliability and predictability, especially at the team level. At the team level, shot quality tends to wash out relative to shot volume. 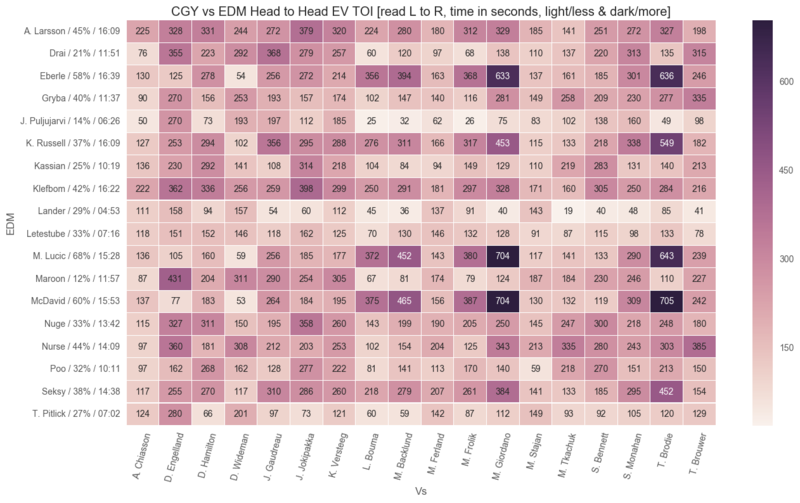 Not to say shot quality doesn’t matter (that’s an unfortunate historical choice of words), but rather that shot quality and shot quantity at the team level correlate heavily, so you end up needing just the (simpler) one. I don’t think this holds at the player level, though. I think there are players that consistently drive shot quality, either for or against or both. 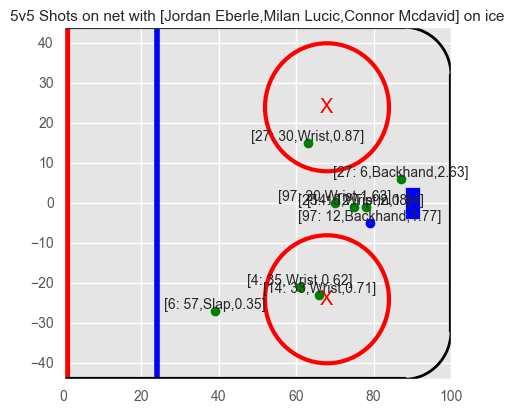 Larsson is a guy that shows a consistent reduction in shot quality against. And of course, McDeity has ludicrous levels of shot quality for. 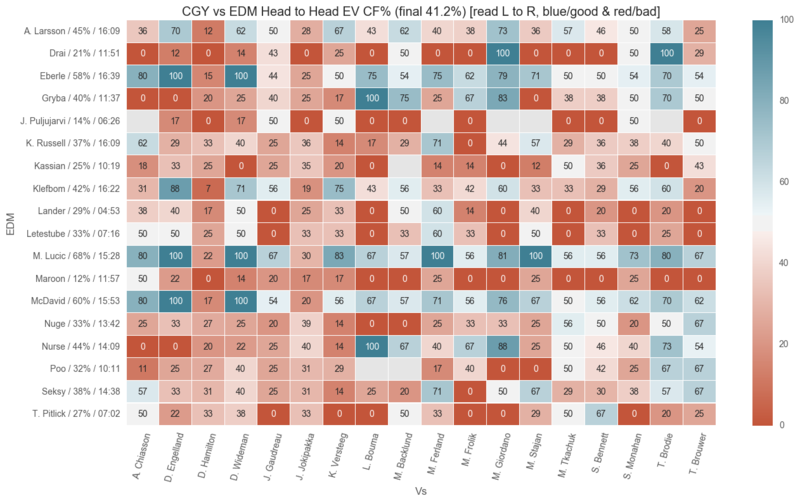 For most players, it probably doesn’t have that big a discrepancy, and you can just use old reliable Corsi. But for certain key players, that’s really where DFF seems to reflect ‘what really happened’ better. Hey first time reading your blog, I got directed here from one of the Edmonton Journal articles where they referenced your blog. Great information. I will definitely be following your page. I would love to see a breakdown video. Keep up the good work. ← G1 2016-10-13 Eat poo and die, Flames!